This tasty Tuna and Bowtie Salad can be served as a side or a main dish. Not only does it taste delicious, but it is packed with 32 grams of protein per serving! Enjoy this bowtie salad year round! 1 Cook bow ties according to package directions; drain and rinse with cold water until completely cool. 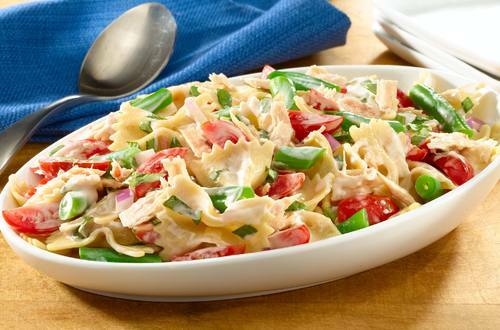 2 Combine Hellmann's® or Best Foods® Light Mayonnaise, vinegar, basil, garlic and pepper in large bowl. 3 Add remaining ingredients; toss well. Chill, if desired. Also terrific with Hellmann’s® or Best Foods® Canola Cholesterol Free Mayonnaise.